The new VZ eVod-eGo Passthrough E-Cig Starter Kit continues to improve upon the accomplishments of the previous versions. The VZ eVod holds approximately 1.5ml of e-liquid and features replaceable vape coils. The VZ eVod keeps your e liquid fresh tasting and produces exceptional vapor. The power saving e cig battery features improves power conservation and prevents accidental discharges. The EVOD is a Bottom Coil Clearomizer with a easily replaceable vaping coil unit. Therefore it becomes dependable and inexpensive. EGo EVOD Electronic Cigarette uses a bottom coil design perfect for thicker e-cig liquid. 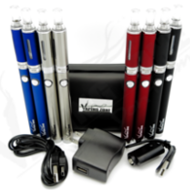 The EVOD uses eGo threading so it will work well with all eGo style e cig batteries. EVOD clearomizers have a metal sleeve protector for long lasting looks. VapingZone is the best online platform for e cigarettes where you will get variety of branded and original EGo style EVOD e cig starter kit online in the USA. So, what are you waiting for? Buy Now!! !